This simple process of writing down my thoughts on what has happened so far is important I've decided, no matter how sporadically I do it. Being reflective is a good thing, and hopefully this blog will serve that purpose for me. I'm not sure the best way to do this or organize such a thing, but on this page you'll find my best attempt. This year I have been fortunate enough to be visited by my best friend Tanner from college thanks to his extremely generous Mom and Dad (thanks Lou Ann and Zach!!). This was a really great thing to have half way through the year, right after my first Christmas away from my family when homesickness sets in for a lot of Fulbrighters. e had some pretty great adventures, the stories of which follow. As soon as Tanner got here he was in for a treat. Two of my roommates at the time have birthdays close together and so they celebrate them together. That night there was a huge and really fun party, and Tanner and I didn't get to sleep until around 5 or 6am. We stayed up talking (in English) with my roommates who were super accomodating because Tanner didn't speak any German (besides the phrase "ausgezeichnet" probably). This was a pretty good start to Tanner's stay, but things were just heating up. Only a few short days later our apartment building celebrated New Year's Eve all together, and this was just spectacular. There was really great food and conversation, but the highlight had to be the fireworks. The sheer volume of fireworks that people had was incredible. It might have even been bigger than 4th of July celebrations in the States. I never knew that New Year's celebrations in Germany were so awesome, but I'm really glad that I had the opportunity to celebrate this holiday with Germans and see how things are done (kind of like every major holiday I've spent here actually, which has been awesome). We also made a trip to Bamberg, which is a really neat city in Germany. The city is incredibly beautiful and I know a few people that have studied abroad there, so it was interesting to see. You can see photos of the city by following this link. They're worth a look, and I wish I had had more time to spend there. Maybe I'll go back soon. After all of the festivities died down (and I changed apartments), Tanner and I headed down to Munich for some siteseeing. 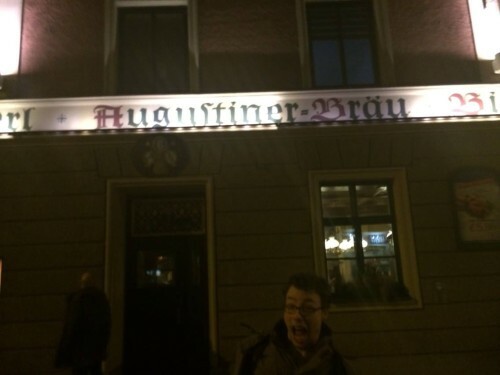 Over the course of a week we went on what we were calling the "Munich Brewery Tour," but was really us just trying beer from each of the six major breweries in Munich: Hofbrauhaus, Lowenbrau, Spaten, Hacker-Pschorr, Augustiner, and Paulaner. We met our goal (as seen below). We also did a few other neat things around Munich like going on a city tour and taking a look at some museums of ancient Greek and Roman statuary. This was pretty neat, but the highlight (and low point) of the week was probably the visit to the Neuschwanstein and Hohenschwangau castles (that first one is the "Disney Castle" everyone talks about). I say that this was the high and low point of the week because on one hand the castles themselves were pretty cool, no denying that, but on the other hand it was so crowded on the train there and back that it definitely took something away from the experience. Knowing this, I might have chosen a different activity for us to do, like visiting the Zugspitze, the tallest peak in Germany. It was still neat though, and if you get a seat on the train (we had to stand on the way there), then it's probably still worth it. 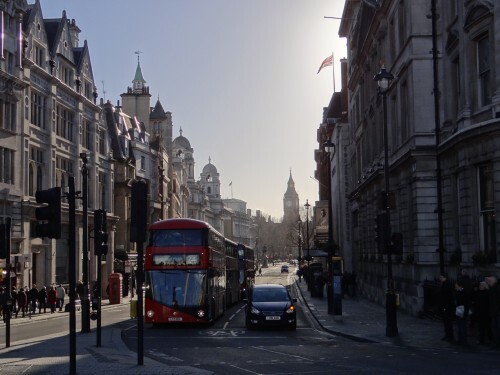 The next major phase of our trip was a visit to London. Unfortunately we were only in London for a few days, but it was still pretty cool nonetheless. It felt so weird seeing signs everywhere in English again after being in foreign language only regions of Europe for about four months, but I readjusted pretty quickly. Since we were only there for a weekend, we didn't actually get to go into many of the buildings, instead limiting ourselves to walk around and try to see as much of the actual city as possible. And we sure did see a lot. Big Ben and Parliament to Buckingham Palace we saw it all. If you would like to see all the photos I took, they can be accessed here on Flickr. I think there were some pretty great shots that I took and I was pretty amazed at how picaresque London was. I had a pretty awesome time reuniting with a great friend from college, and I'm glad I could show him around Germany a bit on his first trip to Europe. If he had half as much fun as I did, then mission accomplished. Anyway, I'm gonna call this one quits now and try to work on some other content for the site. Thanks for reading, hope you enjoyed! The Gang has a Cultural Experience! Way back in Novemer during Bavaria's Herbstferien (basically Fall break) a few other Fulbrighters and I went to Salzburg and Vienna in Austria, and, boy, did we have a cultural experience thanks to Liz. We tried Sachertorte, ate our weight in Mozartkugeln, and were at the same time endeared and embarassed by Liz and Chase's need to wear their tracht around all the time. The trip was an awesome experience, and I'm very glad I got to share it with these wonderful people. Oh, and an old friend from Berea made a guest appearance while we were in Vienna. Without any further ado, here are the highlights. One of the first things we did as a group was go to a ritzy cafe at Hotel Sacher in Salzburg so we could try the Sachertorte and drink coffee because that's what you do in Austria, right? I have to say, while I still may not really understand the difference between icing, frosting, and ganache, that cake was incredible. I think I prefer the Sachertorte from Cafe Demel in Vienna though, which is kind of where the cake originated from. That's certainly a stronger opinion than I ever thought I would have about an Austrian cake, wow. This was a really great experience, even if we weren't exactly dressed for the occasion (see below) and some old Austrian woman kept shooting us dirty looks because we were talking a little excessively. Liz, Jack, and Chase at Hotel Sacher. 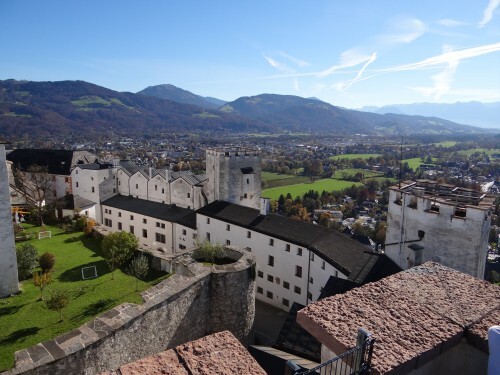 The next thing we did that day was go up to the Festung, or fortress, that is in Salzburg. This is probably the coolest castle-type-thing that I have been to period. And that's including Neuschwanstein (the "Disney Castle"). That's how great this castle was. There was even WiFi! I was so surprised to pull out my phone and see that there was an open WiFi network at this fortress, especially when free WiFi in Europe is so sparse. There was a puppet museum, some antique cannons and WWI weaponry in another museum, and a whole bunch of other neat stuff. The audio tour of the castle was pretty good as well, explaining how the structure developed into what it is today. Oh, and the view. Yeah, the view was spectacular. It was pretty much breathtaking in person. One of the other cool things we did in Salzburg was see Mozart's birthhouse, which I was skeptical about but it was actually pretty neat. They still had some of his original pianos and such in the house, which was pretty cool to see in person and think about seriously famous musical works being composed on them. After looking around a little, I can't seem to find any photos of it, which means I must have neglected to bring my camera with me or the batteries were dead by the time we got there, which is really a terrible oversight now that I think about it. Anyway, you can take my word on it that it was cool. This was pretty much the extent of our stay in Salzburg. We also did a little hiking around the fortress, but I also seem to have failed to take any photos of this as well, which is really a shame because the scenery and views were pretty incredible. On the whole, I really liked Salzburg, and though it's a little expensive (especially the hostels) I would definitely return if I have another opportunity. 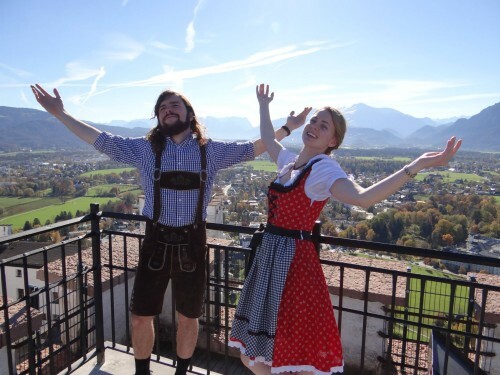 If there is one thing that will always stick out in my mind about this trip though, it will be the fact that Chase and Liz insisted on wearing their Tracht around town. There were some great photo opps though. If you'd like to look at all of the photos I took in Salzburg, you can follow this link to my Flickr. The bad thing is that people wanted to get their picture taken with them. Next The Gang headed to Vienna, where much fun was had. While there we got to meet up with an old friend of mine from Berea, Katherine, who is currently completing a US Teaching Assistantship in Austria and lives in Vienna. I hadn't seen her for quite a while and it was nice getting to see her again in Vienna of all places. I would have to say that Vienna is certainly one of my favorite cities in Europe thus far. 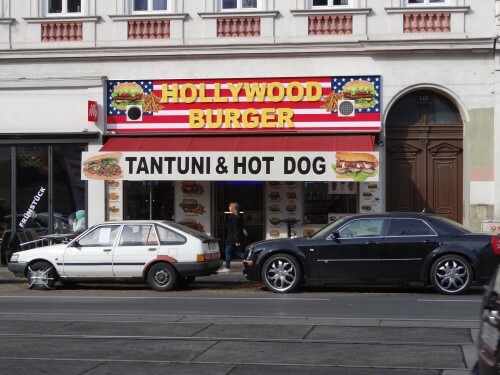 It's of course pretty similar to any large German city, but it just has some element of undeniable class. 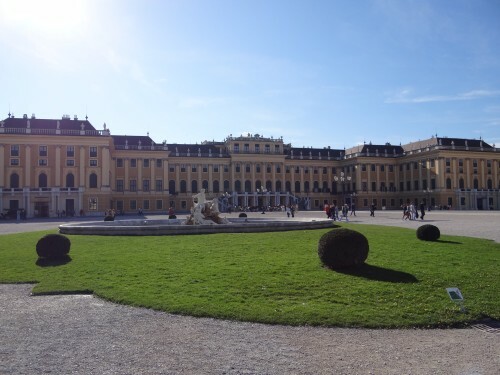 From some of the incredible art museums such as the Albertina to the beautiful Schloß Schönbrunn (Schönbrunn Palace), the city oozes sophistication, and I really enjoyed it. Well, maybe the whole city isn't so cultured. One thing that you have to do in Vienna is get a Wiener Melange (Vienna Blend), which is a type of coffee that is particular to the city. So we did just that in one of the most famous cafes in Vienna, Cafe Central. It was a pretty posh place with tons of delicious desserts and a really nice atmosphere. It was here that we met up with Katherine and a friend of hers also living in Vienna. She showed us around the city a little and gave suggestions for some of the things to see. She suggested the Albertina art museum, which houses a ton of really important prints and a few collections of important impressionist artwork. The focus of the main exhibit when we visited was Henri Matisse and fauvism, which isn't exactly my cup of tea, but it was pretty cool nonetheless. I found some of the portraits particularly intriguing. I think it's always very interesting to think about how the commissioners of portraits choose to have themselves portrayed, what objects they choose to include in the work, and other similar questions can tell you a lot about the subjects I think. The portraits we saw at this time told more of the relationship between the painter and subject though, as there wasn't much in the way of items in the portraits, but it was often clear what kind of working relationship the two people had by examining the portrait, the colors used, the level of detail or lack thereof. 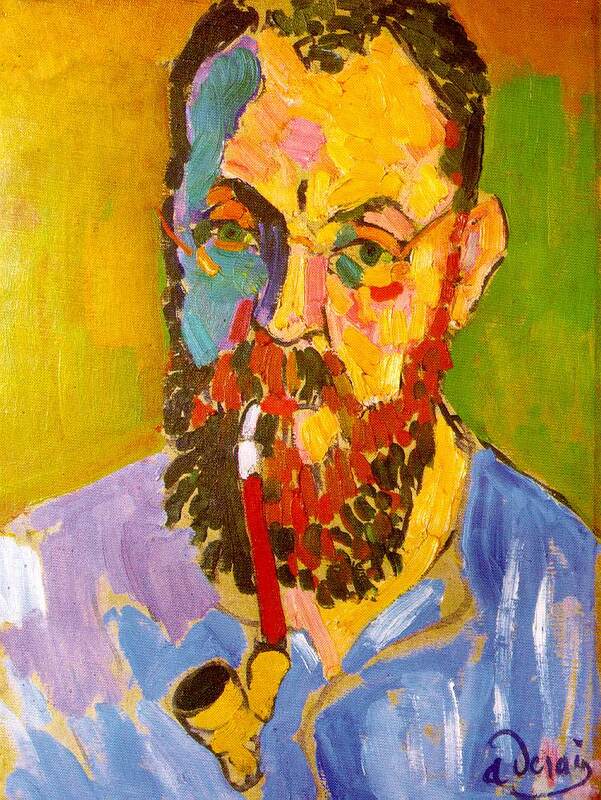 A portrait of Matisse by Andre Derain, another fauvist. Also, if you're in Vienna, you have to see the royal summer palace, Schloß Schönbrunn. It's an incredibly beautiful building and has some quite expansive gardens that are also very beautiful. My favorite activity here was looking at the statues and trying to determine which Greek/Roman figure they represented. I think it's pretty cool how ubiquitious these mythological figures are in western culture, and I like thinking about how we even today still see the themes and stories represented by these figures in modern culture. The front facade of Schloß Schönbrunn. Another thing that you are basically required to do if you visit Vienna is get some schnitzel. It's one of the first things people think of when they think about German food, and the Wiener Schnitzel is supposed to be particularly good. 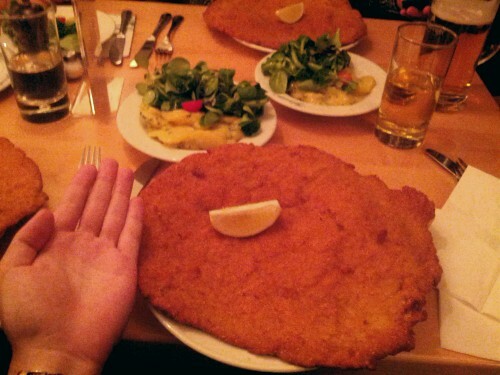 We had schnitzel alright; schnitzel as big as my torso actually. It was from a place called Figlmüller and it was so big that I barely could eat all of it, though somehow Liz managed to destroy hers and a few servings of potato salad as well. The Gang and I did plenty of cultural activities while in Vienna, but probably the high point of these was our trip to the Vienna Operahouse to see Der Rosenkavalier (The Knight of the Rose). There is a special deal with certain tickets at the Vienna Operahouse that makes them only cost around 4€, but there is a catch: the tickets are for Stehplätze, standing seats. So we had to stand through the over four hour opera, but I would say that this was more than worth it. This is often called the greatest German language Operahouse in the world, and it certainly was an incredible performance deserving of that title. The opera itself was very entertaining, and it was pretty fun dressing up for the opera, but unfortunately I did forget my tie. 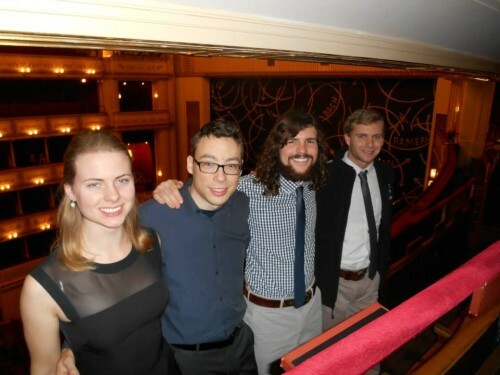 The Gang looking fancy at the opera. If you'd like to see more photos I took of Vienna, take a look at my Flickr set here. I'm sure there are a ton more things that I could write about, but I think that I've covered most of the high points. Vienna and Salzburg are really great cities, and I'm so glad I had the opportunity to visit both of them. Also, I'm sure some readers are wondering why I keep referring to our group as "The Gang," it's because of an inside joke we developed on the trip that pairs each of us up with a character from the hilarious TV show It's Always Sunny in Philadelphia. If there's one thing I could end with, I would have to say that this trip truely was a cultural experience (another inside joke, sorry, I had to). Sorry I haven't called, mom! This post is dedicated to my mom, who just this Monday (03/02) finished her last chemotherapy treatment; she was diagnosed with breast cancer just a short while after I arrived in Germany. She must be one of the most resilient women that I have ever met, and I am so glad to have had her in my life to provide me with love and advice when I needed it most, and I'm even more glad knowing that she will be around for years to come because I'm going to need it again I'm sure. 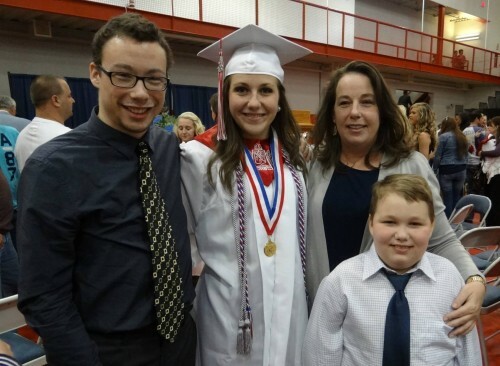 Me and my wonderful family at my sister's HS graduation. This discovery has had a very odd effect on my stay here. This is the second time that I have experienced some kind of turmoil within a short time of moving away from my family, and I have noticed some similar effects of these events on the way I interact with the new environment I was moving into. The first of these things happened less than a week before I had to move into my Freshmen dorm at Berea: the death of my father. We buried him the day before I arrived. In interest of full disclosure my dad and I weren't really that close; he was never a firm fixture in my life, but nonetheless this was a traumatic experience I was undergoing as I made my transition into college life. Something this difficult to comprehend and come to terms with can have strange effects on how you interact with people; couple this with a big thing like moving away from home for the first time and the effects could be pretty bad. They weren't for me though, at least not in the short term. All of this chaos and disruption of my old life in what I traditionally called my "home" caused me to shirk away from it and embrace my new surroundings as a kind of safe haven, a place where all of these bad things haven't happened and have no bearing on the way people interact with you. I was just the new kid, with a bunch of other new kids, trying to figure out how to hang out and do homework at the same time. I think that this also had quite a strong effect on the friendships I made during college as well. The first people I remember meeting are still people that I consider good friends and keep in contact with. In some ways as I was trying to forget a part of my past I attached myself strongly to those who were around me. I think that the untimely passing of my father, even if we weren't close, drove me to really embrace and make the most out of my college experience, which is quite an odd thing to claim. I don't think this was without its drawbacks, but I'll come back to this a little later. When I think about how I reacted when my mom told me she was going to get a biopsy because her doctor had found a lump in her breast, it was very similar to how I felt when I first heard the news about my father. I didn't want to know the truth (I guess this is that "denial" everyone talks about); because what if it was bad? I'm terrible at dealing with these things anyway, and if it went from bad to worse, I didn't know what I was going to do. Unfortunately it did get worse, the tumor was in fact malignant, and I began to recede into my new German world. It's something that I'm certainly not proud of, but that's what happened. I've probably been a little bit better this time around though because I do occasionally talk to my mom about what's happening and how she is doing (unlike in college), but it's a struggle not to fall back into that same pattern of distancing myself from my family and friends back home because something bad happened and I would rather not think about it. This is the drawback I was mentioning earlier. Sure, these experiences cause me to dive into new environments, but there are also costs to this, mainly my closeness to my family. This is something that I am working on, and I know that I'm not quite there yet, but I think that I am getting better with staying in touch and making sure my family knows just how important they really are to me. This problem confronts a lot of people living abroad I'm sure, and, even with our great modern Skypes and Google Hangouts, it's difficult to balance living in a new community and being a real part of that new environment while maintaining meaningful ties with your home and your past. These blogs are one way that I am trying to accomplish both of these goals, as they allow me to reflect on my time here in Germany and share my experiences with my family back home. To some of the other Fulbrighters: how are you all dealing with this? Also, as I am just over halfway through with my time abroad here in Germany, I recently had a startling revelation: I am in freaking Europe. I was brought to this thought by a line from one of my favorite Kanye West songs, "Gone," which goes like this: "Sometimes I can't believe it when I look up in the mirror, how we out in Europe, spending Euros." I am indeed out in Europe, spending (far too many) Euros, and I would like to quickly thank my family, friends, and others who have helped make this dream somehow a reality. As I mentioned in my previous post, getting around in Germany can be pretty difficult. Well, that isn't exactly true; it's more complicated than simply being difficult to do. The problem is that actually things are deceptively similar in all the largest ways, but it's the little things that throw you off. Compared to the States, Germans drive on the same side of the street, the signs are pretty similar, and most public transportation is dead-simple to use once you figure out which train/plain/automobile goes where, so actually getting from one place to another isn't all that difficult nor does it require that much getting used to. I would say the larger challenge is getting around well. So, what exactly does this mean, you're probably asking yourself. That's a good question. Within the context of this post, getting around well means getting accustomed to the little nuances of German day-to-day life, of which there are a great many. This post mentions quite a few things that are supposed to be specifically "German" traits, and while some are less true than others (for instance #6, my Betreuungslehrerin was late to the first meeting we had together), it goes a long way in describing what I mean. It's these little things that really throw you off when you begin living in a foreign country, and these take the longest to get used to. I have become accustomed to many of the differences I have noticed, but certainly not all of them, and some I have found clever ways to avoid entirely. Below I will note some differences between Germany and the US and explain what I think about them. Widespread availability of public transit. There are a lot of good things the states could learn from Germany. I have noted just three above that I think are particularly interesting. Number one, Germans don't really tip. Almost never, unless you're at Oktoberfest it seems. This may seem like a bad thing at first, but the reason behind this is that German servers, bartenders, etc, make just as much money as everyone else (or at least have the same minimum wage standards). It isn't like in the States where waitresses and waiters receive abysmal hourly compensation and the rest of society is pressured into making up the difference. This is a refreshing difference between the two countries, and it's something I greatly appreciate. He's got a point, but nonetheless I do tip. Number two, which is related to number one in some ways, has to do with the sales tax on items for sale. Shopping in the States always provides a big surprise when you get to the register and the cashier adds the appropriate state sales tax to your grand total. Here in Germany you'll never have that problem, as all relevant taxes are included in the listed price for your item. This is extremely useful, especially if you're on a tight budget and don't want to risk being embarassed at the cash register. Doing it somehow other than the German way just seems wrong and deceptive to me now. Number three, Germany's wonder public transportation. Better access to public transit is something that I hope becomes a reality in America within my lifetime (but I'm not going to hold my breath) because it is just great. Back home me and my family were hindered by the inability to afford a car, but this kind of thing is almost a nonissue in Germany. Sure, having a car is probably convenient no matter where you live, but with a transportation system like Germany's, the real need is practically eliminated. Visiting friends around town, getting to the shopping centers, and even visiting other cities is a breeze here, no car required! Lack of technology in classrooms. If the last section made you think I was wearing rose-colored glasses, think again. There are plenty of things that annoy me about Germany, and, interestingly enough, almost every one of them has to do with grocery shopping. Number one on the naughty list is the closing times of stores (exception being the gas stations) in Germany. By 8pm, everything from supermarkets to department stores are closed, seemingly never to open again. Well, maybe this is a bit of an exaggeration, but it's still incredibly annoying nonetheless. Forgot to pick up milk for a late dinner? Too bad. Don't have enough eggs for that birthday cake you're making and it's 7:50? Better luck next year. I really miss the convenience of 24/7 stores like Walmart and the ability to go and get fastfood late at night when the hunger sets in, and this has easily been the hardest thing to get accustomed to. Oh, also all these stores are closed every Sunday as well. Equally annoying. Number two here is perhaps a minor annoyance, but an annoyance nonetheless. Germany is known for their efficiency, and I think the best example of this is at the checkout line at a grocery store. You put all your items on the little conveyor belt just like in the States, but what happens next you could never hope to be prepared for. The cashier scans your items lightning fast and zips them down to a small area at the end of the counter before you have any idea what is going on. Now you're fumbling to get your wallet out and pay for your groceries while the angry mob of Germans behind you grows ever more impatient, and just as a last surprise: there are not grocery bags available. Good luck carrying all of that home. Another Fulbrighter living in Fulda wrote about this as well in a post that you can find here; she also mentions a few things that could have gone on one of these lists as well. This third point is perhaps more job-specific to me, but it is still something that annoys me a great deal. I was sure that coming to teach in Germany, a modern, first rate country would ensure me the proper equipment in classrooms, and, boy, was I ever right. Every single classroom I teach in is equipped with a state-of-the-art... overhead projector, equipped with the latest in transparencies and water soluble markers. Obtaining a projector (or "beamer" as they call it) or speakers to provide a bit of pizazz to a lecture might as well be pulling teeth, and is often much more trouble than its worth. Lack of readily available help in stores. Abundance of holidays (especially in Bavaria, where I live). Inability to make small talk. Our first point here is something that I think Germany is notorious for: generally bad customer service. Customers here are generally left to their own devices and not interrupted by nagging store representatives as often happens in the States. The reason I've put this in the neutral category is because it is often quite nice just to be left alone while in a store and not constantly bothered by employees trying to direct your attention to things you don't really care about. Holidays now; you're thinking I must be crazy thinking that there can be any downside to an overabundance of holidays and therefore days off work, but there is such a thing as too much of a good thing, and this, again has to do with grocery shopping. On many of the holidays here in Bavaria all of the shops close down as well, and not just the little mom and pop shops, but the big supermarkets and department stores as well. This was a particular around the time of the "foodpocalypse," the stretch of time between Christmas and New Year's when everything seemed to always be closed. Overall though, the holidays are probably a positive thing because, man, do I like sleeping. Another Fulbrighter published a blog today that reminded me of number three. It's something that I have become almost totally accustomed to living in a country where you aren't a native speaker of the language, but it is nonetheless something that is very different. Small talk just doesn't happen; Germans don't get it, just trying to fill a silence. This is something I can understand though, so it gets my neutral stamp. Here you can find a link to the blog that brought this to my attention again. And, just because, a little music I've been listening to recently. Enjoy. My time spent in Europe is about half over now, and I thought I had better start documenting it. As with most things, I say better late than never. Since I'm starting so late in the game however, I certainly have a lot of catching up to do. As with any good story, perhaps it is best to start at the beginning. I arrived in Cologne, Germany on the 28th of August. I had a terrible time getting out of the airport, including making a mistake with my luggage and accidentally leaving my checked bag at the baggage carousel and having to be allowed back into the secure section of the terminal to pick it up. Fortunately, German airports seem to be much more laid back than American ones. A nice receptionist simply swiped me back in and I got to pick up my bag, which I soon wished I no longer had. Now, with both of my bags, I began my long journey to the infamous Station Hostel I had heard so much about on the Fulbright Facebook group. This trek proved both arduous and bewildering. 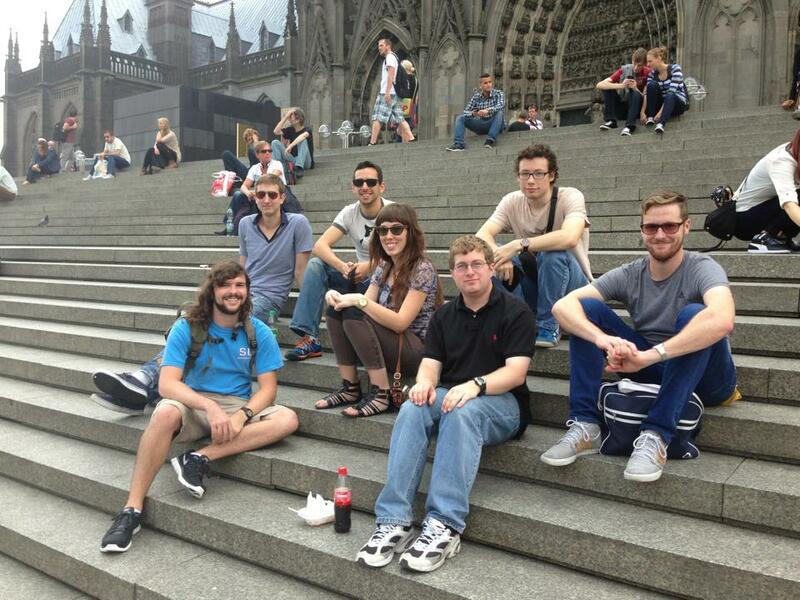 Cologne as a city was incredibly difficult to navigate on the little sleep I had gotten on the plane ride over. After schlepping my two large suitcases and overstuffed bags around the "Domer Koeln" (what I called it later under the weight of jetlag, it's really the Koelner Dom) a few times, I finally found the Cologne information desk and got a map and directions to the hostel, which was, thank goodness, close by. After dropping my bags off, I was contacted by some other Fulbrighters staying at the same hostel and we all got together and visited the nearby city of Ansbach. It was the seat of the first Holy Roman Emperor, Charlemagne. And while I wanted desperately to actually sit in that seat, it was not to be unfortunately. Seen here: a very tired Marty and some happy campers. The next few weeks or so was a huge blur. I spent an awesome week getting to know a ton of cool people at orientation, moved to a new and exciting city and got acquainted with some of the best roommates a guy could ask for. When I first arrived at my new WG (Wohngemeinshaft, kind of like "living community"), I was very disoriented about where I was in the city and I didn't really know anyone, but the first week I was in Nuremberg this was all cleared up. My new roommates Andreas and Chris helped me figure out where to shop (something that is more difficult than you might imagine) and introduced me to some of their friends at an awesome engagement party that they let me tag along to. In just a few short days I was feeling a lot more at home in Nuremberg. It's often said that Germans aren't friendly, but I honestly can't see why if my interactions with the Germans around me is any indication of how they typically behave. Almost everyone I have met has been friendly and helpful in a multitude of ways, be that figuring out German doctors or finding a new place to live when I had exhausted all of the traditional means. Perhaps I'm just lucky, but surely it's more than just that. Well I think that I've rambled on long enough for this post. I'll be adding more commentary on my adventures soon hopefully, so check back every so often and you might see something new. Also, I might try to add a comments feature sometime soon so that you readers can provide some feedback about what you like (and dislike) about the posts, but that's for another day. If you did like the post or have something to say, feel free to email me using the email button located somewhere around the page.